Fall has come to the Northwest and with it the rains, which have been drenching over the past week. But I’m happy to report that despite the weather, dog lovers have continued to come to the shelter to find their best friends. 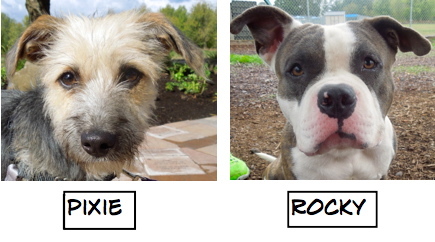 Here are the Blog Dogs who were adopted last week. Because of the rain and strong winds on Sunday, play group was canceled, so no chatter this week. I am so grateful to our Wednesday walkers! 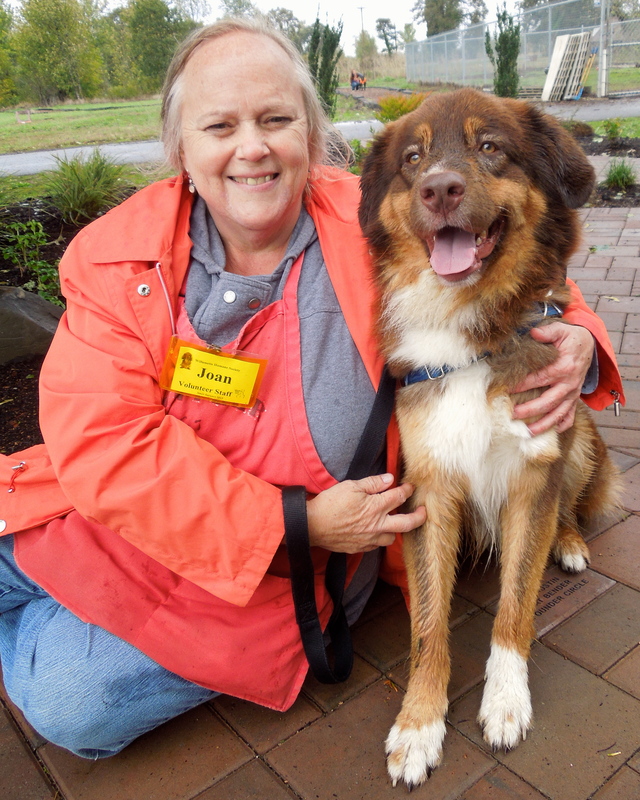 Today was another one filled with showers, but our devoted team of volunteers cheerfully walked, played with, and posed for pictures with our shelter dogs. 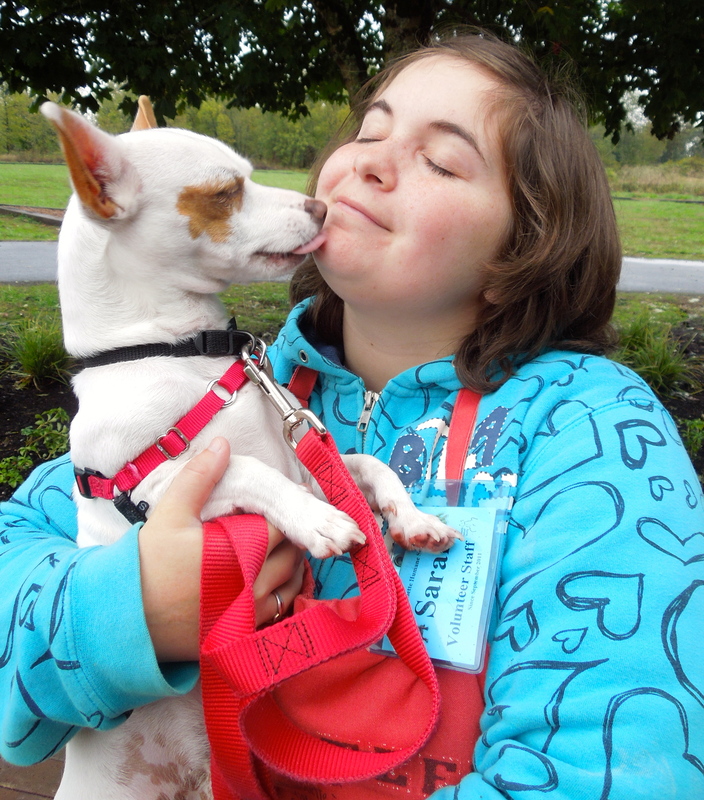 What could have been a dreary day became a happy one for me as I snapped photos of wonderful people and grateful dogs. I’m a mature girl looking for a family who appreciates my wisdom and experience! Today I met Jubilee for the first time. She is a nine-year-old Lab mix and is such a sweet dog. 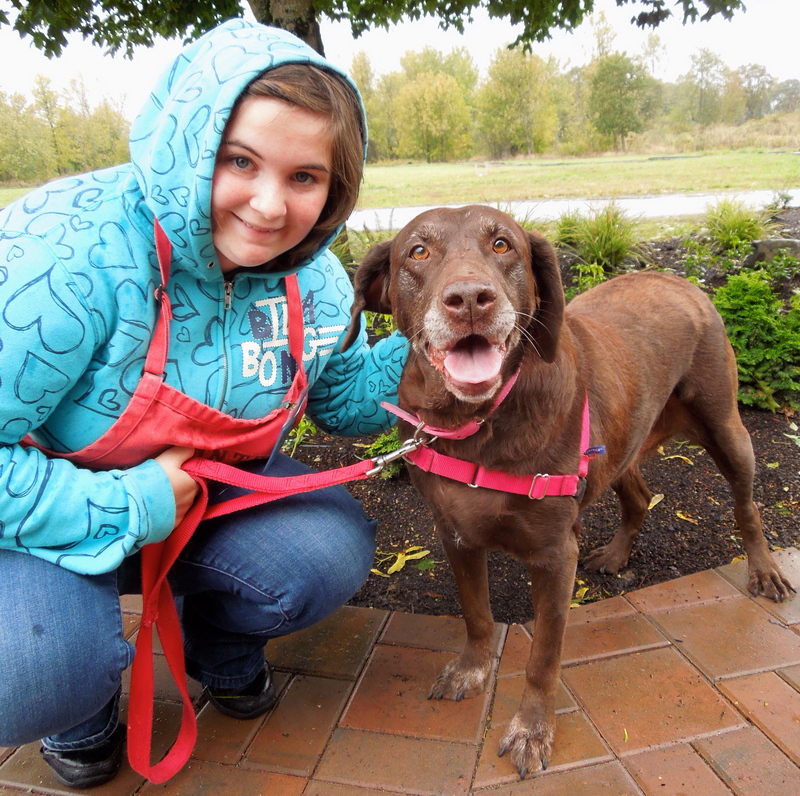 Sarah, who is partial to older dogs, fell instantly in love with this delightful girl. Jubilee is long past the difficult puppy/juvenile stage and won’t need those long hikes or runs. She will be happy with just a walk around the block and then relaxing next to you as you read or watch TV. I’m hoping someone looking for a loyal, calm companion will adopt Jubilee soon. I love the sincere look in her eyes. Looking for a young, eager bundle of energy? That would be ME! 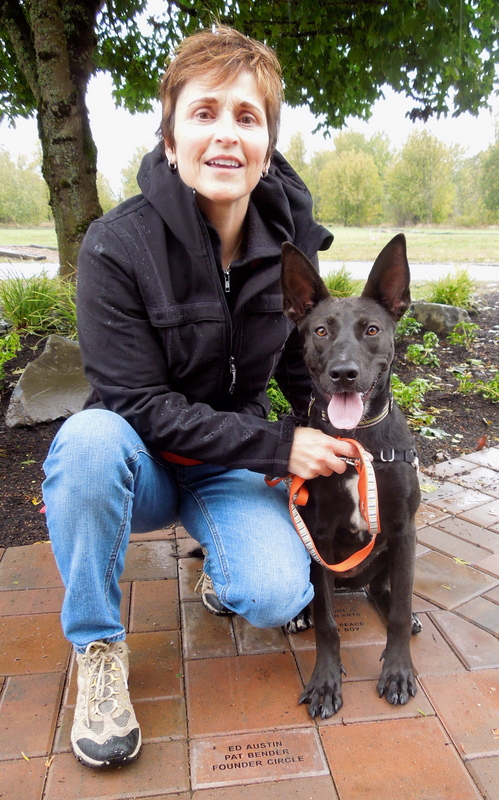 Meet Lulani, a ten-month-old Australian Kelpie mix who is one energetic little girl! Need a jogging partner? Agility trainee? Lulani would love either of these activities. She would also enjoy attending some of the training classes at the shelter and since she is such a smart young lady, she would learn quickly. Here Lulani is today with Angie. The rain didn’t bother her one bit! We’re looking for a home together! We promise to be the best-ever dog pair! Steve and Joan spent some time today with Hunter (left) and his sister, Tara. Hunter is eight and Tara is nine; they have been together their whole lives and need to go to their new home with each other. They are Beagle mixes and both could lose a few pounds, so taking walks around the neighborhood would be great for them. 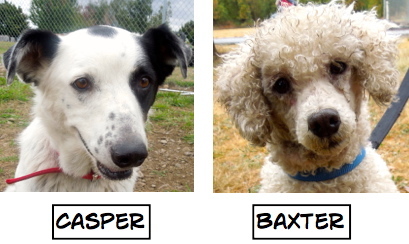 Both brother and sister are terrific dogs who have spent most of their life outdoors and are hoping that their new family will let them be more inside dogs. All you Beagle people out there (you know who you are!) 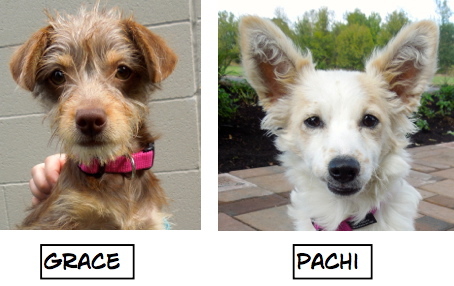 think about adopting this pair! 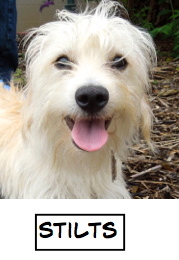 I’m a calm, affectionate dog waiting for YOU! This is Gene, a two-year-old Chihuahua/Miniature Dachshund mix, another dog whom I met for the first time today. He was sitting quietly in his kennel in the Small Dog room and waited patiently for his turn to go outside for pictures. Sarah and I both liked him immediately. He is gentle and took treats politely. Gene is a stray, so not much is known about him, but from what we saw today, he will make a lucky someone a wonderful new best friend! My name is Bogart. What’s yours? 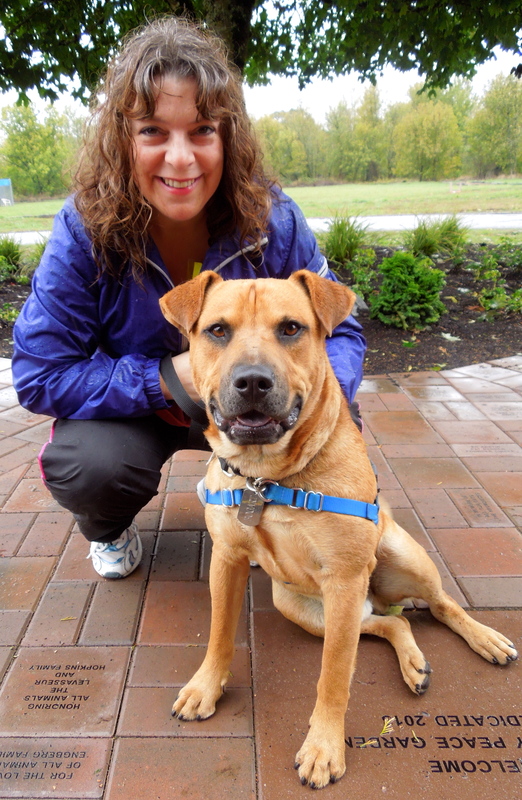 Bogart is a three-year-old Shepherd mix who came from California as one of our S.T.A.R.T. dogs. 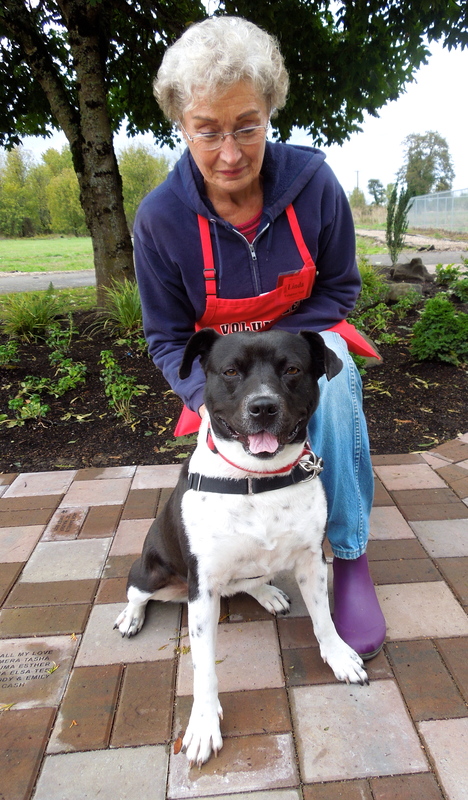 He’s decided he likes Oregon despite the rain and is waiting for an active family to adopt him. Bogart likes to go for walks and romps. He can also be calm and knows several commands. He enjoyed his time with Kathy this afternoon. I have a great smile! This dog has the happiest expressions! Cypher is a three-year-old Australian Shepherd mix. He is a very active dog who loves to explore everything around him. Trying to get him to sit quietly with Joan for a picture was a challenge, as there were so many smells and other dogs to see! Later I heard that he loves the pool out in the big yard and had a great time splashing in it. Needless to say, the rain didn’t bother Cypher. 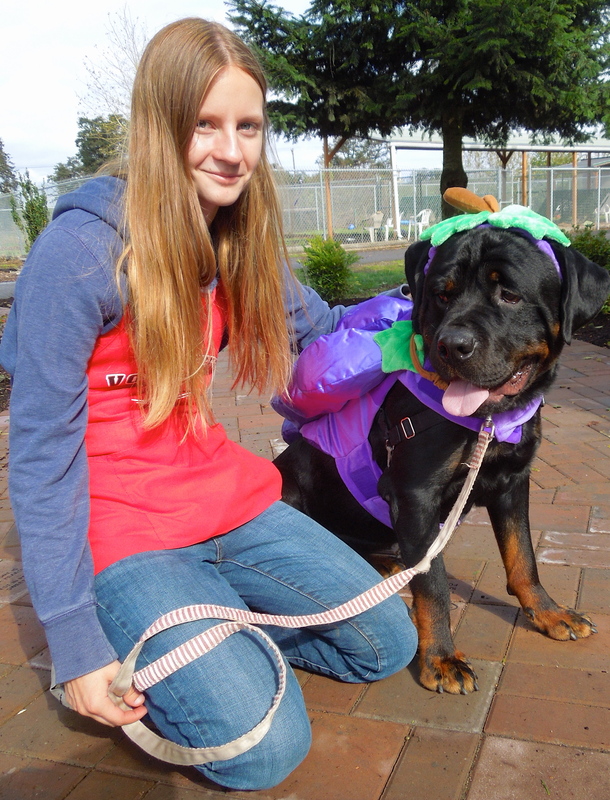 October means Halloween is coming…and that means costumes! A couple of dog costumes were donated to WHS today and we couldn’t resist trying them on a couple of cooperative (though slightly embarrassed) dogs. 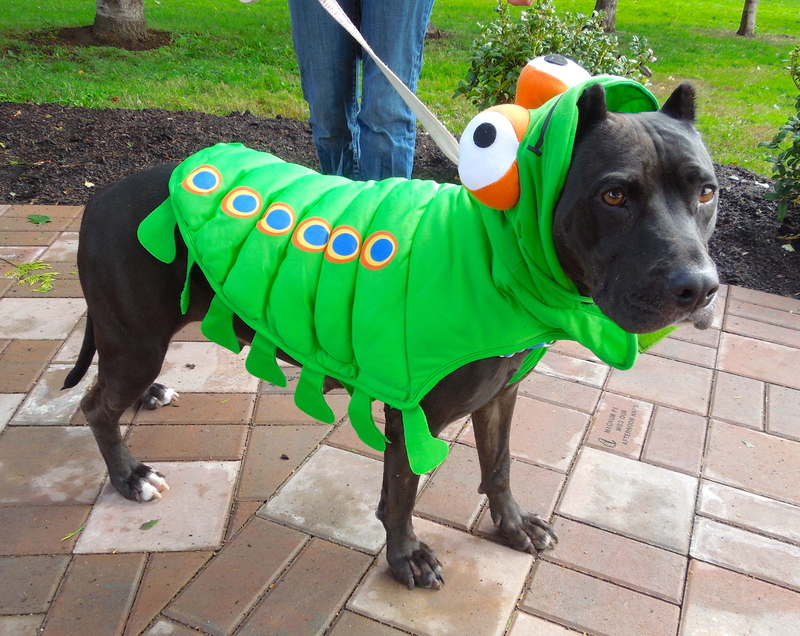 First, one of my current favorites, Emma, a three-year-old American Staffordshire mix, agreed to put one on. She was such a good sport! Emma is a real people-dog and loves to please, but trying to get her to smile is quite the challenge. 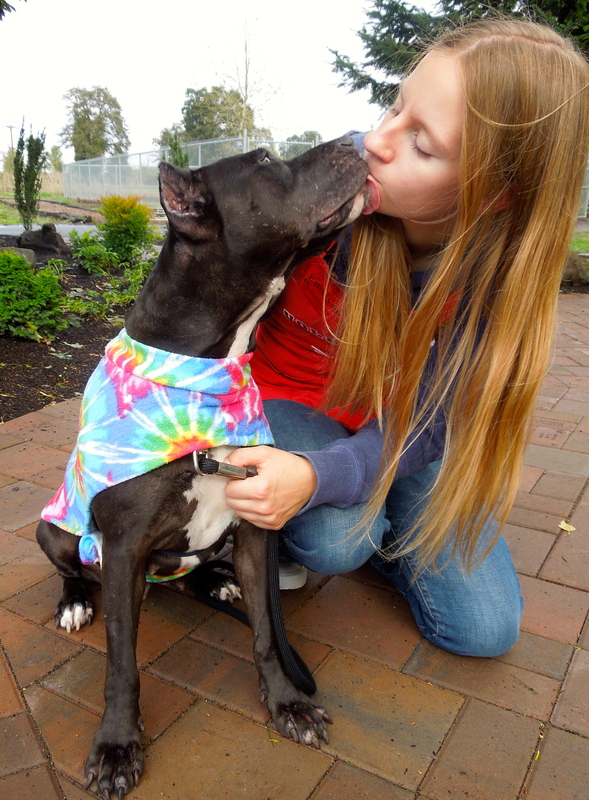 Here she is with Emelynn, wearing a tie-dye sweater to brighten a rainy afternoon. 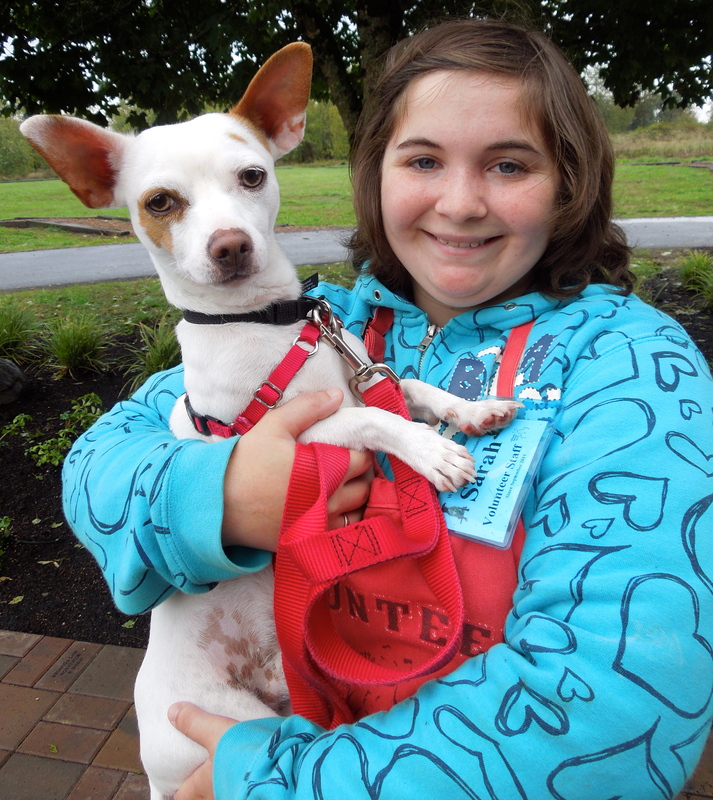 Emma is another California S.T.A.R.T dog hoping to become part of an Oregon family. 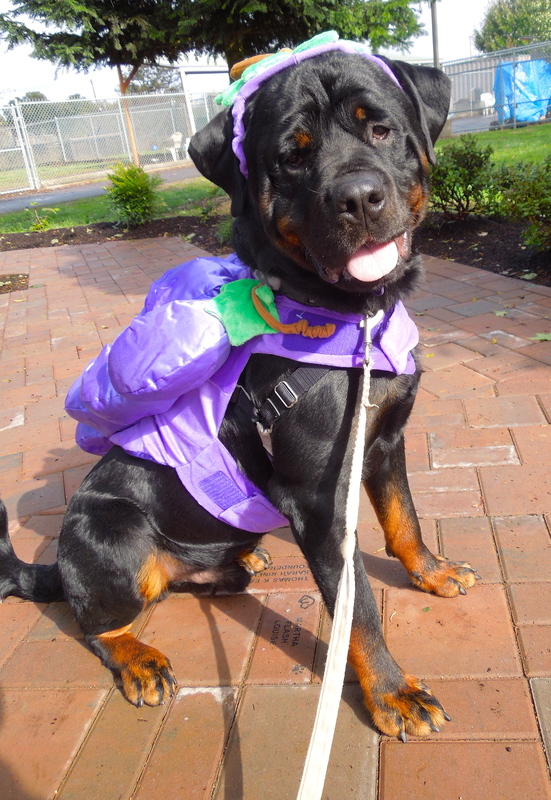 Smokey Boy is a one-year-old Rottweiler mix. Another good sport, he agreed to try on a bunch-of-grapes costume. Smokey is a gentle giant. He is treat-motivated and takes them politely. He needs some work on not thinking the leash is a tug-toy at times, but mostly walks well on a lead. He would be a great candidate for some WHS training classes. Emelynn spent quite a lot of time with this big boy today. I’m still here waiting for my perfect family! I enjoyed watching Deb playing in the big yard with Faye this afternoon. 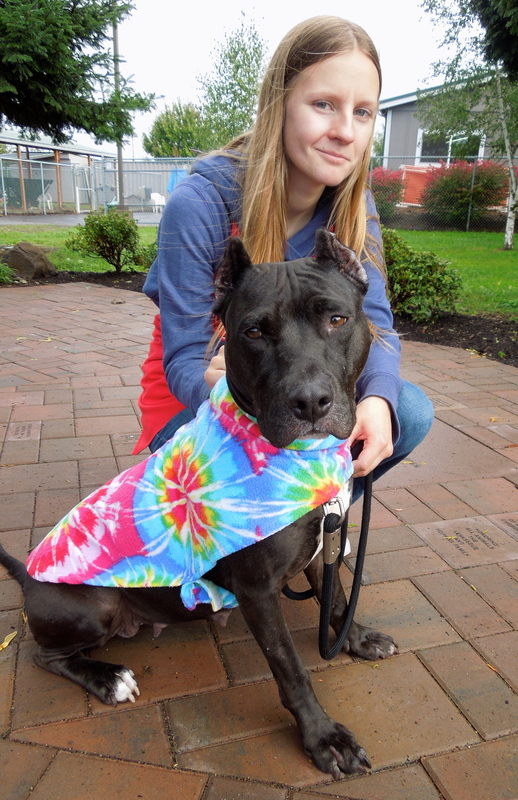 Faye is a fun-loving two-year-old Pit Bull Terrier mix. She thinks she is a lap dog and loves to cuddle with people. She has a great time in play group romping with the other dogs. However, she should probably be the only dog in the home, at least in the beginning. Her kennel presentation is not good, as she is so eager to get out and be with people. I’m hoping potential adopters will not judge her wrongly when they see her in her kennel, but will ask to meet her in a yard. 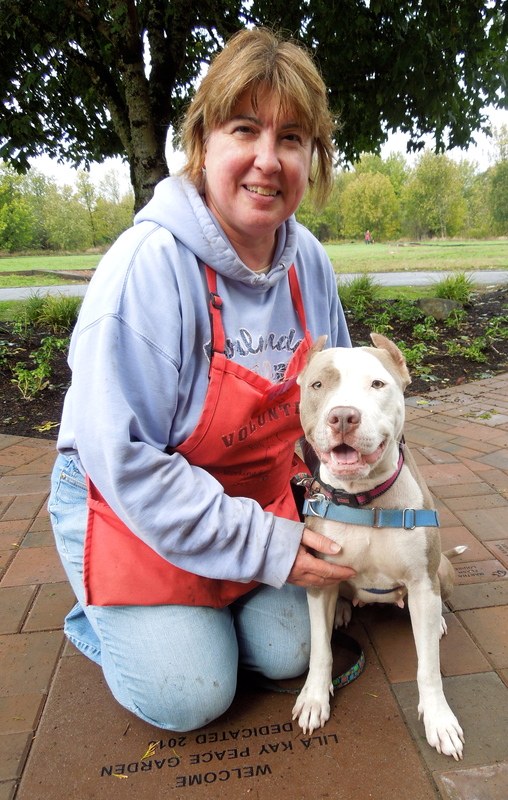 Faye has many people who love her at WHS, including Deb! I’m new here. I’m a good boy, hoping for a new family soon. 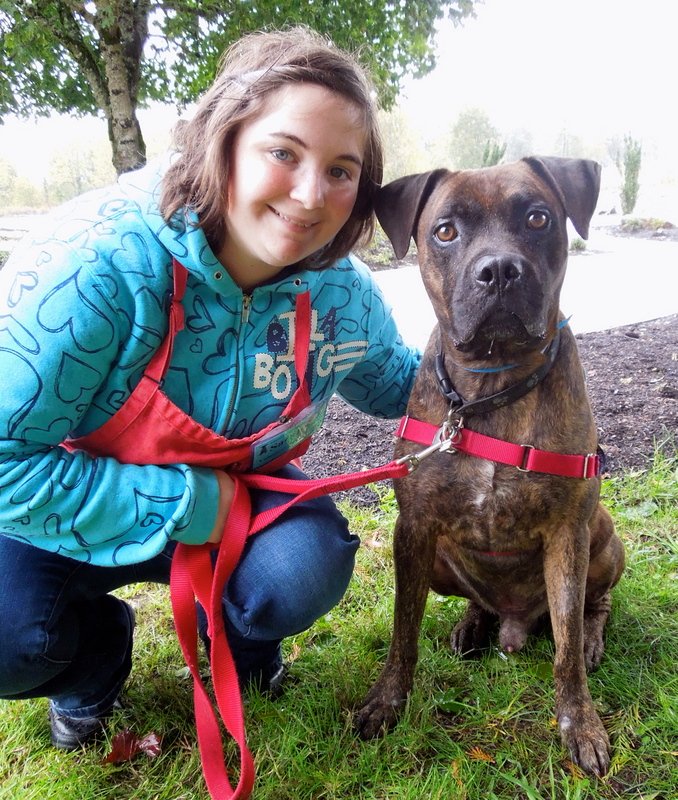 This is Moose, a six-year-old Boxer/Mastiff mix with soulful eyes. Sarah and I both fell for him immediately. He walks well on leash, took my treats gently and knows several commands. He was just neutered, so is wearing a cone at the moment, but I told him for his photo shoot we’d take it off. He was pleased. Moose has lived with another dog and with a child. He’s a good boy! I’m still with my foster mom, but I came to WHS today to visit! I was so excited to see Gilbert this afternoon! I had asked Jolene, his foster mom, to sub as a dog walker today and Gilbert got to come along. He is still waiting for his forever home. 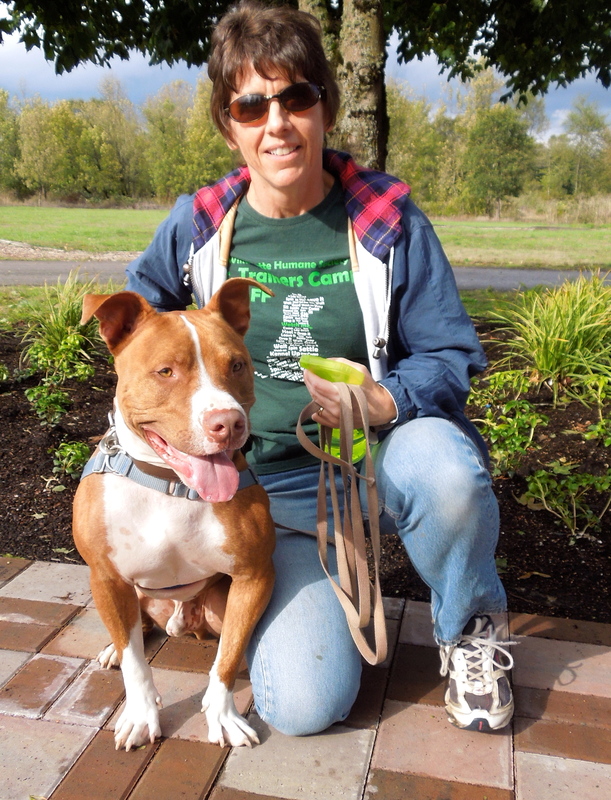 Gilbert is a two-year-old Pit Bull Terrier mix who has been hoping for his very own family since last December! 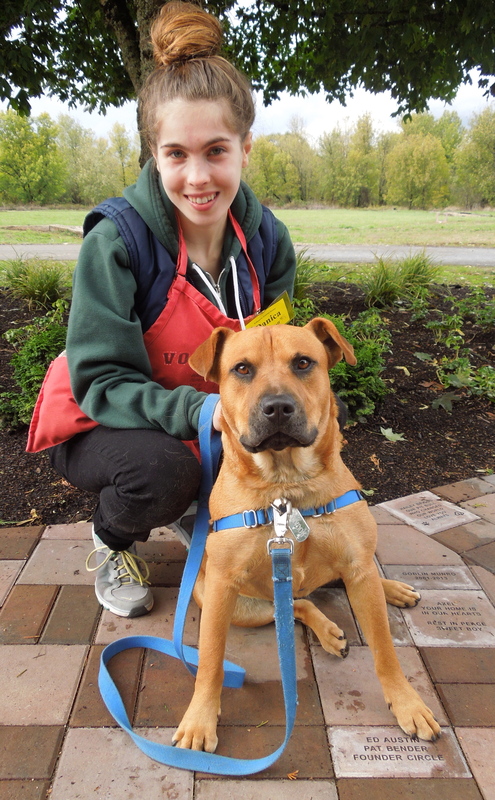 Everyone at the shelter loves him and hopes that he won’t have to wait much longer for his perfect fit of a family. I have written about him in many posts and even made a movie about him. You can see everything by typing his name into the search box in my post. Will my new person come soon? I’ve been waiting a long time. I couldn’t leave today without taking another picture of sweet Jersey, who has been at the shelter since July. She is a three-year-old Bull Terrier mix. She is so good in her kennel, patiently waiting and hoping that her new person will find her. Another S.T.A.R.T. California dog, here she is today with Linda. I so hope she’ll be adopted soon. I’m heading to visit family in Michigan on Saturday and won’t be back in Salem until October 20. 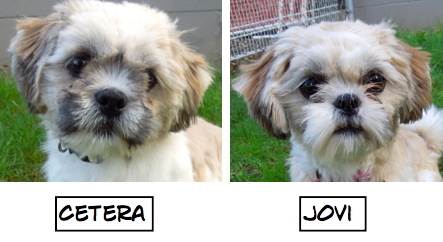 I hope I’ll have lots of happy adoptions to report on October 23, my next post. Couldn’t make it to my volunteer shift today due to two dental appts (one not expected). So, it was nice to see the update on who has been adopted, etc. 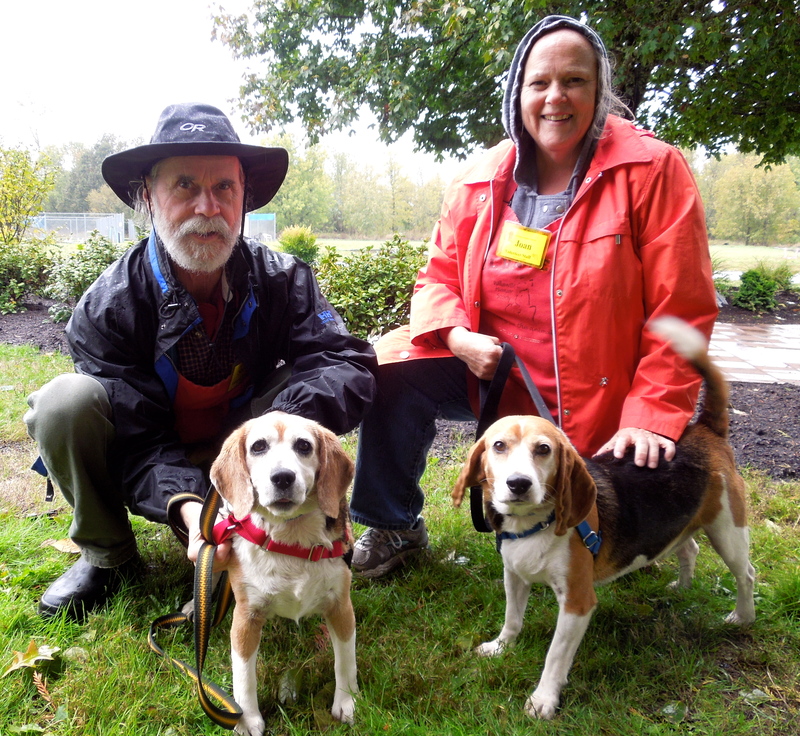 We do have dedicated volunteers to walk the dogs in the kind of rains we get here in Oregon. The early fall rains sometimes leave us unprepared.